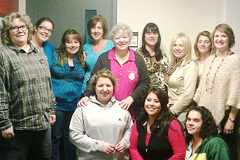 A group of twelve local child care professionals met regularly from September through November participating in the Child Care Partners’ first cohort for First Connections. First Connections is a new curriculum focusing on fostering strong positive relationships with infants and toddlers in respectful, responsive environments. This curriculum has a total of 21 modules and 61 hours of training. This cohort completed the six core classes the end of November and then met with the instructor/coach at their worksites for an observation and coaching session in December. As you can see in the picture, this group has developed a strong bond. They had a lot of fun together and hope to continue to take First Connections classes in the future. Julie Smith was the instructor/coach for First Connections in our area. You can see that Julie made the class fun and educational. Child Care Partners is currently offering First Connections classes quarterly. Check the Calendar for information. The standardized training is based upon a widely-used training curriculum, Program for Infant/Toddler Care (PITC), developed by West Ed in California. PITC, which has been adopted by many states and training organizations, is based upon research and best practices with infants and toddlers in care and education settings. The PITC training materials were adopted by Oregon in the 1990s for use in training infant and toddler providers in a format known than as First by Five. In 2004-2006, a state work group re-examined the PITC materials and explored other possibilities. The work group re-affirmed Oregon’s commitment to use the PITC materials and to reformat the training curriculum to the current First Connections. In 2011 the coaching component was added. The First Connections training curriculum and coaching activities are offered in Oregon by certified First Connections Trainers. These trainers have attended a training-of-trainers in order to explore the underlying research and concepts in the PITC philosophy and curriculum, the format and training delivery of the First Connections training sessions, and the First Connections coaching component.